“10 Years” follows a group of friends on the night of their high school reunion who, a decade later, still haven’t quite grown up. 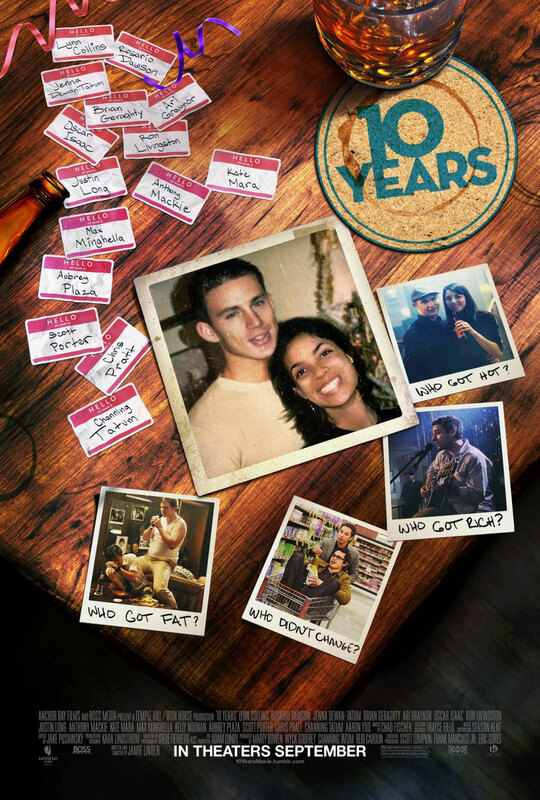 Channing Tatum plays Jake, who is deeply in love with his girlfriend (Jenna Dewan-Tatum) and ready to propose until he runs into his high school flame (Rosario Dawson) for the first time in ten years. Jake’s friend Cully (played by Chris Pratt) married his cheerleader girlfriend (Ari Graynor), and has been looking forward to the reunion so he can finally apologize to all the classmates he bullied in high school. However, after a few too many drinks, the jock-turned-family man ends up reverting back to his old ways instead. Meanwhile, longtime rivals Marty (Justin Long) and A.J (Max Minghella) spend the night still trying to one-up each other to impress the coolest girl in class (Lynn Collins), who now has a secret. The famous one of the group, Reeves (Oscar Isaac) is now well-known musician, but is still too shy to talk to the high school crush (Kate Mara) who inspired his one hit wonder. During the movie, we did a short discussion about how Jenna Dewan-Tatum looks like an older version of Vanessa Hudgens and how Kate Mara is really pretty but her face is so “boney” that it has a “skull” look (no offense to her fans!) I like her with the fleshier look! Both of us compared the movie with Silver Linings Playbook, I prefer Silver, while she prefer 10 years. But they are both a difference of 0.5 star. It’s a movie that will make you wonder what it will be like if you are to reunite with your high school mates 10 years later. Will everyone “grow up”? Or are they still the same? I think it would be better if there were subtitles for the film, I guess some of us might have difficulty catching what some of them are saying over their “drunken slur”. For me, I guess I was anticipating if Jake will fall back in love with his high school flame when they met again (I’m guessing everyone’s bets on YES) I don’t think I will want to spoil your fun, but I’m quite relieved on the final answer. The film is very heartfelt, no gimmicks, you see how some people never change, some finally braced his courage to admit certain things and definitely, how some “glamoury” position may just be façade. If you are worried about being worse off their your ex-classmates during the reunion, guess what, this film might make you feel a little better. 🙂 What I like about the movie is its ability to make me smile throughout with their silly yet genuine acting. 10 Years will be in cinemas from 17th January 2013 onwards. Like the 10 Years Movie Facebook Fanpage. Event invitation from Incinemas. No monetary compensation was received for the movie review.